I’ve been waiting all year to have fresh red tomatoes in my backyard, but this green tomato relish recipe is SO incredibly delicious that I didn’t even think twice about plucking some off the vines before they could even ripen. I occasionally get obsessed with certain recipes, and my friends – this is one of them! I don’t think it’s a secret that I am also slightly obsessed with the crock-pot refried bean recipe and let me tell you those beans are suddenly reinvented when topped with this relish (in addition to the standard melted cheese and sour cream of course). Not that I haven’t been caught just eating this relish by the spoonful. :) Can you tell I am smitten? Anyway due to all the chopping and simmering this recipe will require several hours of your time from start to finish, which isn’t a common theme with my recipes so I wanted to be sure to point that out. If you aren’t into the “canning” thing you can easily shave off some time by simply freezing the end results. Either way you won’t regret it…yum! Also, I would be remiss if I didn’t mention that I was introduced to this recipe at my canning class with Ashley Eller earlier this year. Thank you Ashley! Also, please note it’s imperative that the rules of canning are always followed to a “T” in order to prevent spoilage or harmful bacteria in your end product! Make Relish: Remove stem and core from green tomatoes and roughly chop into ½ inch or 1 inch pieces. Add to a large pot with heat turned off while you prepare rest of ingredients. Peel, roughly chop and add onions to pot. Remove stem and seeds from red bell peppers and roughly chop as well. Remove core from apples, discard, and roughly chop (including peel). Mince garlic and add to pot along with onions, red bell peppers, and apples. Add apple cider vinegar and salt to pot and set over high heat. When vinegar comes to a boil turn down to low and simmer for 1 hour and 15 minutes while stirring occasionally. While relish is simmering finely chop jalapenos (only remove/discard seeds for half of them), chop cilantro, and set aside. I highly recommend wearing latex or rubber gloves while chopping the jalapenos otherwise your hands could sting for a few hours…I know this from experience! To Can Recipe: Fill canning pot three-quarters full with water, cover, and set over high heat until it comes to a boil. You can either sterilize your jars in this pot of boiling water for 10 minutes or by using the heated drying cycle in your dishwasher. It’s important to keep the jars hot and sterilized until ready for use. Be sure all canning utensils have been sterilized in hot soapy water as well. Also fill a small pot with water to sterilized lids and bands. Water for lids/bands should be hot at about 180 degrees F, but not boiling. Leave them in hot water (on simmer) until ready for use. If water gets cold remove lids/bands and heat up water to 180 degrees F again before adding them back in. After the 1 hour and 15 minutes is up the relish should have boiled down a bit. Add the jalapenos, cilantro and cumin to pot and simmer for 5 more minutes. Use either an immersion blender or potato masher to process the mixture into a small dice, but not a puree. 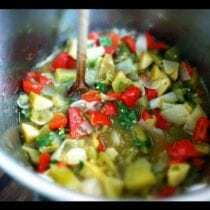 I highly recommending owning an immersion blender if you don't have one already...it's perfect for pureeing soups and other recipes like this relish without having transfer batches back and forth between a blender, which makes a mess! To Freeze Recipe: At this point divvy up relish among freezer safe containers and once cool transfer to freezer. If using glass jars be sure to leave enough room at the top for the relish to expand during freezing. You can skip the last two steps. To Fill Jars for Canning: Turn relish back up to a boil. Remove jars from hot water, shake out excess water, and set near pot. Using a sterilized ladle and funnel, fill the jars, leaving ¼ inch headspace at the top. Slide a non-metallic utensil into jar to remove any air bubbles. Wipe off rim of jar with a clean cloth. Using sterilized tongs (or magnetic lid lifter) carefully place lids onto filled jars. You can touch top of lids once they are on jar, but do not touch underneath or on inside of jar to keep everything sterilized. Screw on bands by only touching the outside, although bands should not be too tight. To Process Jars: Bring water in canning pot back up to a boil. Using jar lifter carefully transfer jars to canning pot. Jars should not directly be touching the bottom of the pot and instead be separated either by a canning rack or simple dish towel. Once water comes back to a boil start timing from that moment and process jars for 15 minutes. After time is up using jar lifter carefully remove jars from boiling water and transfer them to a clean dish towel. Let jars rest until they cool. If jar lids haven’t already popped/sealed you should hear the sound…and if a jar doesn’t seal within 24 hours transfer it to fridge and eat within 3 – 4 weeks. This recipe looks amazing :) Thanks for sharing! The one part that makes me nervous is all the apple cider vinegar. I can’t STAND the smell of that stuff, and even though I know it’s so healthy, I hardly use it. Do you still notice it once this recipe is finished? I personally don’t notice the vinegar flavor, but if that concerns you and you are NOT going to can the recipe you could reduce the amount of vinegar and store the relish in the freezer. This sounds delicious, I can’t wait to try it! I have a question about the Tattler reusable lids- I’ve come across them before when searching for a BPA-free canning lids, but apparently Polyoxymethylene copolymer is made from formaldehyde, so that made me nervous. (Not that BPA doesn’t make me nervous…! ) Tree Hugger wrote about them here: http://www.treehugger.com/green-food/bpa-free-canning-lids-now-available-from-tattler.html. Do you have any info about the Tattler lids to ease my mind about them (am I misunderstanding the formaldehyde thing)? Thanks! Ashley – I want to make sure you saw the answer to your question…Brad from Tattler answered it, but it wasn’t left as a reply (instead as a new comment). I did see it, thank you so much. I’m glad they became your sponsor because I’d been wondering about their lids for literally a year but never went through the extra step of contacting them with my concerns. I feel good about his response so I’ll be using their lids this canning season. Thanks again! To answer Ashley’s question directly, the answer is yes, trace amounts of formaldehyde are present in the polyoxymethylene copolymer we use, much like hydrogen is molecularly bonded in water, and carbon dioxide is molecularly bonded in air. However, the conditions required to cause a molecular breakdown releasing formaldehyde are only present at temperatures above 460 degrees fahrenheit. The melt point of the plastic is 329 degrees fehrenheit, which itself is significantly higher than safe canning practices allow at 250 degrees for pressure canning. Practically speaking, the release of formaldehyde is only a concern when extreme heat (460 F) or significant flame is present, as in the case of a structure fire. You can find additional information related to our product by visiting our company website at http://www.reusablecanninglids.com . Thank you for pointing out the Reusable Canning Lid product. Been canning for years and never heard of it. I never liked the metal lids. I’m going to find these and buy them if I can! So, I am curious. I have never cooked with green tomatoes but am totally open to it. Also, the list of ingredients varies greatly in tastes from onion to apple to vinegar to jalapeÃ±o, etc. I am having a hard time imagining what this relish tastes like. Is it spicy, tangy or somewhat sweet? Can you try to describe the taste please? Thanks! Oh my gosh it is soooo yummy! I think it’s most similar to the flavor of a really good salsa…my husband says it’s “tangy” and I think it’s a little sweet, but it does have a little kick from the jalapenos and a Mexican flavor from the cumin. I’m normally not a fan of green tomatoes, but this looks so delish that I can’t wait to try it! I love that you give directions for canning, since I’m really getting into that this year. Brad, thank you so much for clarifying that for me! I’m looking forward to trying your reusable lids! This looks great! Can’t wait until my tomatoes in my garden are ready! OHHH MY! I was sooo excited to stumble upon your blog on pinterest! I have been gradually trying to eliminate sugar and all processed foods especially over the past year. It sure is a task…and while I do have a homeopathic DR and master herbalist living right next door, who is an immense support for me, I have been looking for recipes…(he has no small children and doesnt understand my need to replace the recipes for chocolate chip cookies, breads and mac and cheese, with acceptable options. So, this site is going to be a lifesaver for me! I am so excited!!!) 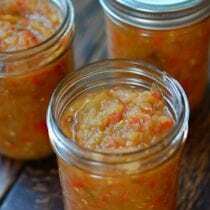 Anyway, I was immediatlely brought to this link…Green Tomato Relish- I just made this recipe this past fall for the first time and our family just LOVES it. My recipe had sugar in it though- I love the idea of adding apple to the recipe to substitute for the sugar addition. LOVE it! Im so excited. Thanks for doing this blog! I can’t tell you enough! This looks DELICIOUS! I canned a bunch of apples and barbeque sauce last year, and I may just have to add this to my plans! I am a huge fan of crockpot beans too, and I can just imagine how yummy this would be on top! Thanks!!! Made mine last night and got 12 jars! It is fantastic! I still have quite a bit of green tomatoes and think I will make another batch! So is there a trick to picking a green tomato? Just pick it before it turns red? I want to try this recipe before we move and have to leave my beautiful tomato-filled plants behind! Its perfect! Exactly…just pick it while it’s green (before turning red)! Are the reusable lids and canning jars safe for freezer storage or is there a brand you would recommend? I am trying to reduce my carbon footprint, and find a better storage solution than bags in the freezer and fridge. This is a great site, and I have been recommending it to everyone. Thanks! It tastes sort of like regular pickle relish but better.I mix mine with ketchup and use it on my cheesebuger by the spoonfull per each bite.My recipe is a little different than this one. I am thinking of trying this now at the end of our tomato season but am wondering where you sourced your raw vinegar. Unfortunately in the small town where I live, such things are hard to come by. Do you only find raw vinegar at specialty type stores? Do you have to use unpastuerized cidar vinegar, or will regualar work? My husband and I have very different tastes when it comes to salsa but we both loved it. Just got done making a batch (eating it warm on tortilla chips right now). YUM! I was a little worried about the vinegar smell during the cooking process, but after adding the last few ingredients, it all came together. Can’t wait to try it with your refried beans, which were also delicious! So I just finished canning a batch of this…yum! Besides topping tortilla chips and refried beans, what other suggestions do you have for using this? I know we already discussed on FB, but just want to reiterate that it’s good anywhere you would use salsa. Enjoy! Hi! This looks delicious! I am wondering about the immersion blender. Is it really necessary? I do not have one and do not really have a good blender to use (though I do have a processor, I imagine it would make a mess to transfer it back and forth). What do you think? Would it still be good if left chunky? Thanks for the recipe, looking forward to trying it! I used your recipe, as it sounded the best of all I researched. I processed my veggies to a fine chop, as opposed to blending them after cooking, as I was looking for a looser relish. Thanks for posting. I would also recommend the Tattler brand lids. A tad more expensive up front, but saves money and a lot of metal in the long run. When all was said and done, I tripled the recipe, as I had a fairly good amount of tomatoes. I ended up with 23 pints plus one quart! I also used habaneros and jalapenos; whatever was left in the garden. As this has such a salsa feel, I would probably up the spice level on future batches. If you are going to give it as gifts I would use the regular Kerr or Ball lids because you mite not get your reusable ones back. I’m wondering what the benefits are of canning over freezing? I have made this many many times and this year I entered it in the Alabama National Fair and won SECOND PLACE! This is a WONDERFUL recipe. Thank you so much for it! I share it all the time. I live in Seattle and therefore have too many tomatoes that didn’t have time to turn red. So thank you for the inspiration! Well it is 8:00 pm and I just finished making my first batch of green tomato relish and I must say this is so yummy. Here it is the first of Nov. and I still have lot’s of tomatoe’s mostly green and I was wondering what I could do with all those tomatoe’s,this was the perfect answer. I know I will be making another batch for Xmas gifts if I can dare part with it. I love your blog.I do not have children but I love looking at your school lunches,makes me think a litter differently about packing my own lunch. Thanks so much so the great ideas and the time you spend on researching products. Hoping it will be okay to have chopped all the veggies and measured out the cider vinegar for a triple batch to do in the morning. After prepping it got too late and I have time in the morning. This recipe is amazing and we can’t wait to try it. Did you blanch and remove the skin from the tomatoes? 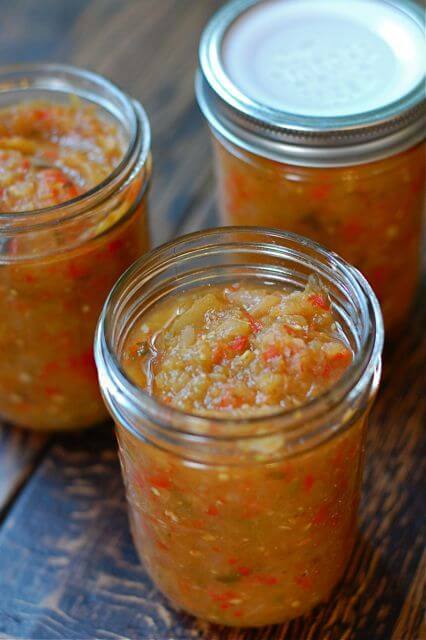 Came upon this via Google search for Green Tomato Relish, and was thrilled to find a no-sugar recipe. Also very pleased with your excellent instructions. We made it last night (so much for a long night’s sleep, but we are still smiling!). Forgot to add cumin at the end, and it is still delicious. Might try adding some cumin after the fact, but doesn’t necessarily need it. Thank you very much! I have a question on your relish. While it is simmering for the 1.5 hours, should it be covered? it looks great and i am looking forward to trying it. I leave it uncovered …good luck! I just made this this morning and wanted to send my thanks for sharing such a great recipe. This was a home run! Delicious, well balanced, tangy, spicy, slightly sweet from the apples, but the flavors of the veggies shine through. We will be keeping this recipe around. Many thanks! Great recipe! Have some green cherry tomatoes and tomatillos waiting to be relished. Hi Heidi. Use it as you would any relish. I love it as a salsa, too. What if the hot peppers are left out? Are they needed to “make” the flavor of this? It sounds so good – until I get to the hot peppers. I don’t want to leave out an ingredient, spend all that time making this and then finding I should not have left out that ingredient. I always have a lot of green tomatoes that get eaten by squirrels as soon as they turn red. I’m glad to have a good way to use some of these before they disappear. It is looking very yummy. I am thinking about to cook soon for the family tomorrow. Because they also love this recipe- tomato relish. What sort of recipes / dishes do you use this on? Is it more of a condiment or do you include it inside of dishes? Thanks for your reply! This looks delicious regardless. Thank you for sharing this recipe. Very well detailed instructions. I would love to try it out in my kitchen and share this recipe with my friends. When I processed my jars in the boiling water bath I did not cover the jars with water since I didn’t know I should. If they are sealed properly are they safe to store? The seals all are seem good, except one. When I processed my jars I never covered the jars in water because I didn’t know I had to, for the hot water bath. They all seem to be sealed well. Are they safe to store? Hi there. This might help: http://foodinjars.com/2009/11/how-to-check-that-your-seal-is-good/comment-page-1/.